The Patient-Centered Clinical Decision Support Learning Network is an Agency for Healthcare Research and Quality (AHRQ)-supported effort that brings together diverse stakeholders to promote a sustainable community around developing, disseminating, and applying evidence-enabled, patient-centered clinical decision support. This group has been working on a set of scenarios that illustrate a desirable future state where patient-centered clinical decision support (PCCDS) is applied to improve pain management and opioid use. The scenarios include specific PCCDS interventions. 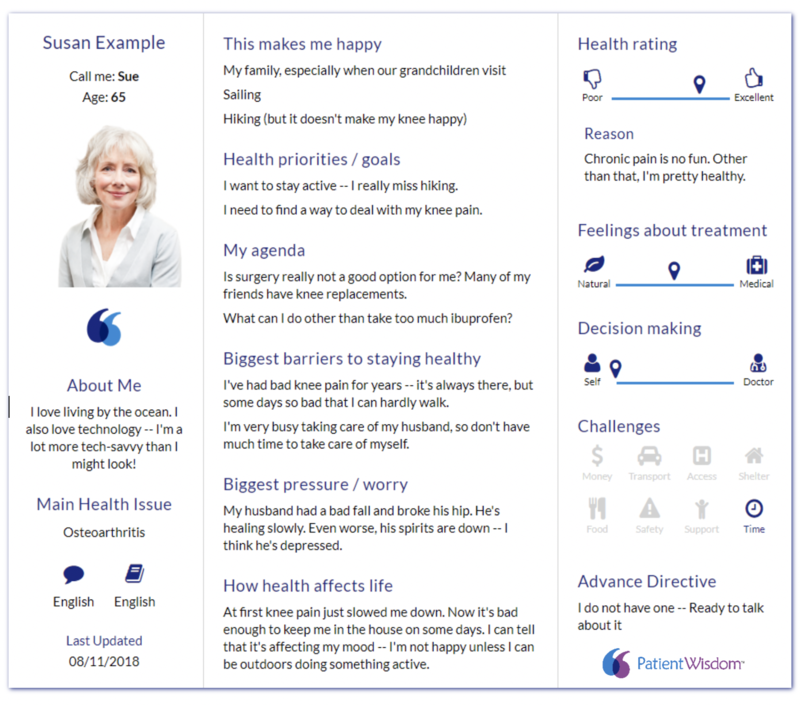 The PatientWisdom inSIGHT summary sample shown below shows how PatientWisdom directly addresses PCCDS key interventions (#4 and #13). 13 Open non-synchronous communication channels between patients/caregivers and clinicians/support staff Portals and websites for FAQs, status reports, pre-visit questionnaires, custom questions and concerns, self-management guidance/tools. Audio, video, virtual education. Office, home and telehealth appointment scheduling.